The son of F. Wighton Flint, Sir William Russell Flint was born in 1880 in Edinburgh. He studied with a lithographer there but from 1900 he worked as an illustrator in London before he began to paint almost completely in watercolors. He became a member of the Royal Society of Painters in Watercolours in 1917, where he became president from 1936–1956. In 1933 he was elected a member of the Royal Academy. 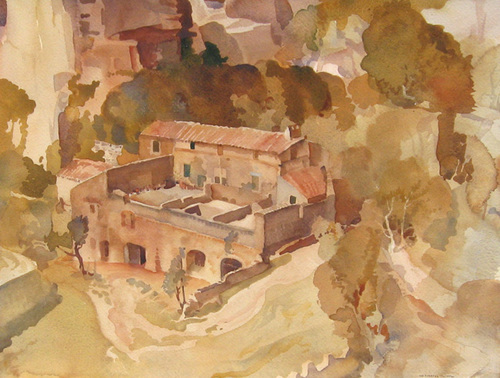 Sir William Russell Flint is particularly renowned for the works he brought back from his trips to France and Italy. In 1905 and 1906 he started showing his work at group exhibitions, often at the Salon of the Societe Nationale des Beaux-Arts in Paris. He exhibited his work in London in 1906 and 1907 at the Royal Academy, as well as in Venice in 1909 and 1914 and in Berlin in 1914. In 1912, he started working for the Riccardi Press in London where he provided watercolor designs for color illustrations of poems by M. Arnold. This spring, Mark Murray Fine Paintings will be exhibiting a group of works by Sir William Russell Flint (1880-1969), who was arguably the most accomplished British watercolorist of the Twentieth Century. These include a classic beach scene in Northumberland, a view in Provence and a sumptuous château interior in Normandy. Please contact us if you are interested in selling your Sir William Russell Flint paintings or other artwork from the 19th century and early 20th century.